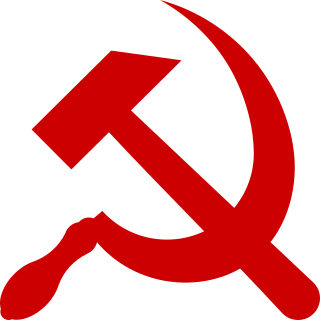 The hammer and sickle is a far-left symbol meant to represent a union between the peasantry and working-class, that was first adopted – as Russian: серп и мо́лот, translit. serp i mólot: "sickle and hammer" – during the Russian Revolution. At the time of its creation, the hammer stood for the proletariat and the sickle for the peasantry—combined they stood for the worker-peasant alliance for socialism. The sickle symbol resembles a sickle used to harvest grain crops and the hammer is one that would be used to make a razor sharp edge on a sickle or scythe. 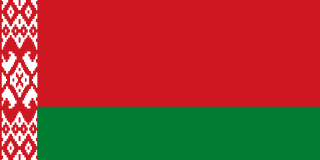 The national flag of Belarus is a red and green flag with a white and red ornament pattern placed at the staff (hoist) end. The current design was introduced in 2012 by the State Committee for Standardization of the Republic of Belarus, and is adapted from a design approved in a referendum in May 1995. It is a modification of the 1951 flag used while the country was a republic of the Soviet Union. Changes made to the Soviet-era flag were the removal of symbols of communism and the reversal of the colors of the ornament pattern, from white-on-red to red-on-white. Since the 1995 referendum, several flags used by Belarusian government officials and agencies have been modeled on this national flag. The current flag of Kazakhstan or Kazakh flag was adopted on 4 June 1992, replacing the flag of the Kazakh Soviet Socialist Republic. The flag was designed by Shaken Niyazbekov. The color choices had preserved the blue and gold from the Soviet era flag minus the red. The color red was used in early designs of the current flag, and continues to be used in variants for the Kazakh Armed Forces. The Flag of the Byelorussian Soviet Socialist Republic was adopted on December 25, 1951. Prior to this, the flag was red with the Cyrillic characters БССР (BSSR) in gold in the top-left corner, surrounded by a gold border. Between 1937 and the adoption of the above flag in the 1940s, the flag was the same, but with a gold hammer and sickle above the Cyrillic characters and no border. Between 1919 and 1937, the flag was red, with the Cyrillic characters ССРБ (SSRB) in the top left-hand corner. In early 1919, a plain red flag was used. The final BySSR flag was used until the collapse of the Soviet Union in 1991. 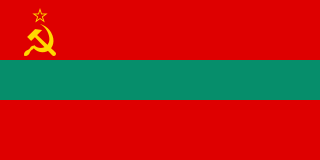 A flag based on this design is used as the current national flag of Belarus. The flag of the Turkmen Soviet Socialist Republic was adopted by the Turkmen SSR on August 1, 1953. Although similar to the Flag of the Soviet Union, the design is identical to the flag of the Kirghiz SSR with a ratio of 1:2. The two blue stripes between the red represents the rivers Amu Darya and Syr Darya, the red represents the "revolutionary struggle of the working masses", the hammer and sickle represents the peasants' and workers' union, and the red star is the symbol of the communist party. A red star, five-pointed and filled, is an important symbol often associated with communist ideology, particularly in combination with the hammer and sickle. It has been widely used in flags, state emblems, monuments, ornaments, and logos. Red Star is also Alexander Bogdanov's 1908 science fiction novel about a communist society on Mars. The coat of arms of the Georgian Soviet Socialist Republic was adopted on May 20, 1921 by the government of the Georgian Soviet Socialist Republic. The coat of arms is loosely based on the coat of arms of the Soviet Union. It shows symbols of agriculture. The red star rising above the Caucasus stands for the future of the Georgian nation, and the hammer and sickle for the victory of Communism and the "world-wide socialist community of states". The coat of arms of the Kirghiz Soviet Socialist Republic was adopted on March 23, 1937 by the government of the Kirghiz Soviet Socialist Republic. The coat of arms is based on the coat of arms of the Soviet Union. It shows symbols of agriculture on a backdrop of the Tian Shan mountains, surrounded by a frame of folk art of the Kyrgyz people. The red star was added in 1948. The rising sun stands for the future of the Kyrgyz nation, the star as well as the hammer and sickle for the victory of communism and the "worldwide socialist community of states". The State Emblem of the Tajik Soviet Socialist Republic was adopted on March 1, 1937 by the government of the Tajik Soviet Socialist Republic. The emblem is based on the State Emblem of the Soviet Union. It shows symbols of agriculture. The red star is prominently featured with a small hammer and sickle within it. The rising sun stands for the future of the Tajik nation, and the star as well as the hammer and sickle for the victory of communism and the "world-wide socialist community of states". The emblem was replaced with the new emblem in 1992, which uses a similar design to the Soviet one. The coat of arms of the Moldavian Soviet Socialist Republic was adopted on February 10, 1941 by the government of the Moldavian Soviet Socialist Republic. The coat of arms is based on the coat of arms of the Soviet Union. It shows symbols of agriculture, an outer rim featuring wheat, corn, grapes and clover. The red banner bears the Soviet Union state motto in both the Russian and Moldovan languages. In Moldovan, it was initially "Пролетарь дин тоате цэриле, униць-вэ! ", then, from the 1950s "Пролетарь дин тоате цэриле, уници-вэ! ", both transliterated as "Proletari din toate țările, uniți-vă!". The acronym "MSSR" is shown only in Moldovan ("РССМ"). The coat of arms of the Ukrainian Soviet Socialist Republic was adopted on March 14, 1919 by the government of the Ukrainian Soviet Socialist Republic and subsequently modified on November 7, 1928, January 30, 1937 and November 21, 1949. The coat of arms from 1949 is based on the coat of arms of the Soviet Union and features the hammer and sickle, the red star, a sunrise and stalks of wheat on its outer rims. The rising sun stands for the future of the Soviet Ukrainian nation, the star as well as the hammer and sickle for communism and the "world-wide socialist community of states". The State Emblem of the Soviet Union was adopted in 1923 and was used until the dissolution of the Soviet Union in 1991. Although it technically is an emblem rather than a coat of arms, since it does not follow traditional heraldic rules, in Russian it is called герб, the word used for a traditional coat of arms.